Marantz SA8003 SACD review | What Hi-Fi? SACD isn't the most popular format, but there are enough fans out there to merit an occasional new player. 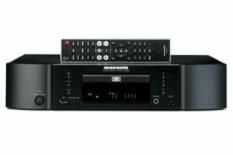 This Marantz also embraces more modern formats, including MP3, WMA, WAV and AAC music files via a compatible player. We had no trouble connecting the office iPod Touch. With CD and SACD playback, the SA8003 puts in a solid, committed display. Many will be charmed by the richness and warmth on offer. Spin Jill Scott's album The Real Thing Words And Sounds Vol 3, and the Marantz is in its element. Scott's vocals sound silky smooth and seductive, bass notes come across full-bodied and weighty. But listening to the Marantz over a prolonged period is a bit like indulging in your favourite comfort food. While the sound is reassuringly safe, there's no real excitement to anything. Top players at this price are more Michelin-starred in their sonic ability, capable of serving up a more organised, detailed and entertaining sound. Spin an '80's classic such as Duran Duran's View To A Kill, and the Marantz seems restrained, as if reluctant to let loose. And, while it's true that stepping up to Mike Oldfield's Tubular Bells SACD allows it to produce a more involving sound with greater depth and insight, there's still a lack of rhythm and fluidity. The SA8003 is a warm, welcoming SACD player that won't offend, but it lacks the spark really to set your music collection alight.